This quilled bear angel card features a quilled bear made by me with darling die cut angel wings. Each piece of the bear had to be curled to size from cardstock cut by me and placed by hand. 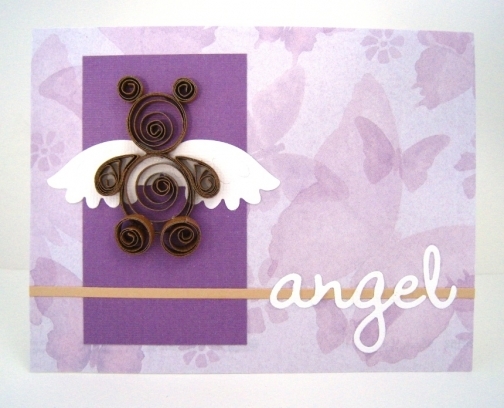 The word "angel" is made with die cut letters. The bear is nestled admidst a purple watercolour butterfly pattern. Purple is a great gender neutral baby colour. Are there any little angels in your life? 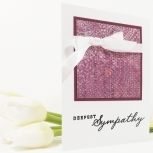 This baby card is frameable in a shadow box (not included) for baby room decor. The quilled creations of today find their roots in Paper Filigree. Paper Filigree is the art of making things out of rolled paper. 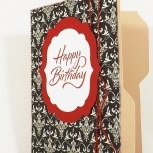 When paper filigree started, the paper was rolled around a feather quill which created the name paper quilling! The back of each card bears a shop label, signature and creation date. If actual shipping is $0.50 (Canadian) less that the shipping charge, you will be refunded the difference over $0.50.